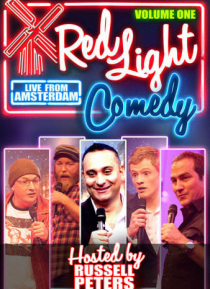 Hosted by Russell Peters, Red Light Comedy is shot in historic Amsterdam and brings together 24 of the world's funniest stand-up comedians for one unforgettable comedy event. Volume One of Red Light Comedy - Live From Amsterdam is full of international flavor and non-stop laughs. Features comedians Russell Peters, Brendon Burns, Kyle Kinane, Bert Kreischer, Andrew Lawrence and Tom Rhodes.